Richard Pachter: Where Do We Go From Here? As we'd mentioned in an earlier review, one business sector is booming. Books examining the current economy and the causes of its precarious condition are apparently a growth industry — at least on the production end. Previously, we looked at attempts to identify and explicate the origins of this mess. This time, we'll scrutinize several ''where do we go from here'' efforts, though there's more on the way and we'll inevitably examine another batch before too long. The 21st Century Economy: A Beginner's Guide. Randy Charles Epping. Vintage. 336 pages. If you're a bit confused about the contemporary economic landscape, Epping's guide is an excellent primer that explains terms and concepts like crowdsourcing, pollution rights, program trading, cloud computing and the like, as well as evergreen concepts like bankruptcy, privatization and more. It's cleanly written with clear examples so if you're a bit confused and need a refresher course, this is an excellent place to begin. The Ultimate Depression Survival Guide: Protect Your Savings, Boost Your Income, and Grow Wealthy Even in the Worst of Times. Martin D. Weiss. Wiley. 240 pages. Weiss is a commentator and purveyor of free and fee-based wisdom, and a renowned bear. So the premise herein is: forget about a recession; we're either in or heading into a depression; take the requisite steps, include getting out of stocks, selling short, buying gold and investing in currency. This is all well and good if you're an investor and clearly, that's the audience this book is aimed at. In fact, anecdotes from the author's father — who, we're told, (along with Bernard Baruch) was one of the few people to make their fortune during The (previous) Great Depression — are larded throughout. But for those of us who aren't quite liquid and are living from paycheck to paycheck — or without one — Weiss' book is just rather (you guessed it) depressing. 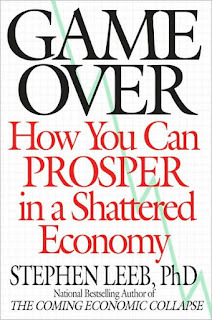 Game Over: How You Can Prosper in a Shattered Economy. Stephen Leeb. Business Plus. 256 pages. Leeb is another cheery fellow, as indicated by the title of his previous book, ''The Coming Economic Collapse.'' But one needn't shoot the messenger. Rather it's worthwhile to hear from someone clever enough to recognize the signs that we were heading in this direction before it became obvious to the rest of the financial press (plus the cheerleading squad on CNBC). It's similar in some ways to Weiss' admonitions, though a little more expansive and thoughtful. He looks a bit more in-depth at world markets, products, capabilities, politics, psychology and the rest of the picture. It's still pretty downbeat, but he searches for a silver lining, a light at the end of the tunnel — or something positive — with mixed results. 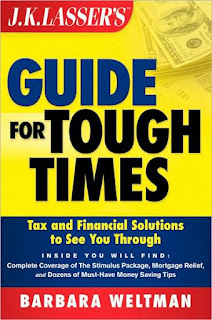 JK Lasser's Guide for Tough Times: Tax and Financial Solutions to See You Through. Barbara Weltman. Wiley. 224 pages. Weltman is the voice of reason. Her book is a pretty thorough compendium of common sense for consumers, investors, workers, retirees — virtually everyone who's living and breathing, earning and/or spending money. As such, there are few (if any) surprises or revelations to be found within, but for solid, practical and conventional advice, this is an excellent source, especially since common sense isn't nearly as common as we may think.